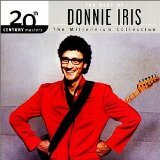 Donnie Iris (born Dominic Ierace on February 28, 1943) is an American rock musician known for his work with The Jaggerz and Wild Cherry during the 1970s, and for his solo albums since the 1980s with his backing band, the Cruisers. He wrote the #2 Billboard hit, "The Rapper", with the Jaggerz in 1970 and was a member of Wild Cherry after the group had a #1 hit with "Play That Funky Music." He became known as a solo artist in the early 1980s with the #29 hit "Ah! Leah! and the #37 hit "Love Is Like a Rock". In addition to performing on the first three Jaggerz albums and the fourth and final Wild Cherry album, Iris with his solo band has released eleven studio albums, one EP, two live albums, and two compilation albums. He continues to release new material and tours throughout the greater Pittsburgh, Pennsylvania and Youngstown and Cleveland, Ohio areas.